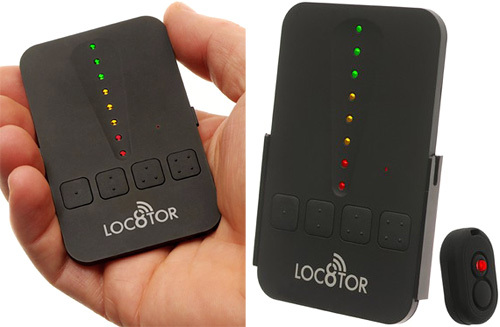 Loc8tor Lite Tracking Device | OhGizmo! While the Loc8tor Lite lacks the fancy back-lit screen of the original Loc8tor, it more than makes up for it with a considerably smaller package. The credit card sized device can be used to find anything that has one of the homing tags attached to it like your keys, your car and even your pet. While the unit only comes with 2 tags, it’s actually able to track up to 4 different ones that have been registered to it. To use the Loc8tor Lite you basically just have to select which tag you’re trying to find, turn around in a full circle and then walk in the direction of the strongest signal indicated by the LED lights or audio beeps. It has a range of about 400 feet (with a clear line of sight) and will guide you to within an inch of the selected homing tag. You can get it directly from the Loc8tor website for $79.99 while extra tags are available in packs of 2 for $44.99. I love this thing – I wish the tags were smaller, but my life could definitely use something like these. Nah. I just know it, I’d lose the tracker too. I bought it in a flash, great for tracking my 3 y daughter on crowded beaches.